As the daylight fades sooner these days, my little fig tree, festooned with tiny white lights, is now called into service each day as soon as evening shadows lengthen. Her express purpose? To create a cozy glimmer in the corner of my dining room. Already the room feels cozier, softer, more inviting. A few lights... just a simple thing... but, oh, the pleasure I get every time I pass by. Laura Ingalls Wilder once said, "I am beginning to learn that it is the sweet, simple things of life which are the real ones after all." We're discovering she's right, isn't she? So here's wishing you cozy pleasures... whatever time of day it is when you read this and in whatever way they make you happy! Delightful. Love so many of the sayings from the Little House series. Oh, Brenda....I'm cozied by this sweet scene and the sentiments expressed. Yes, the sweet, simple things ARE the real ones after all. What a great quote and sooo true. I love that you have a little fig tree lit up in your house all year long. It's like a little part of Christmas stays with you throughout every season. That's really cool. Enjoy your day. There's something about twinkling lights that makes everyone feel cozy. Maybe it harkens back to past Christmas and that feeling of goodwill? Don't know, but it certainly is pleasant. Love the quote too. Thank you for showing us, your Faerie Light festooned Fig Tree. :-) Love it. And the ambiance, it gives. :-) Mmmmmmmmmm, yes. And let us pay more attention to the little joys, which come our way in life. Not just the *icky stuff* which comes. :-) A lesson, to be learned. after their short career in the sky." Looks lovely... Yes, she's right. Ahhhhh... and I'm simply delighted to find each of your comments here. Interesting that we all love little lights filling cozy corners. Loved that Edith Sitwell quote you shared, Christine... a good one to keep in mind as this season draws closer. Maybe that is God's idea for winter... mmmm... I'm going to ask Him. Auntie, I enjoyed that phrase by Medbh... especially 'after their short career in the sky'. Blessings... and HUGS... to each of you. I've been popping over to visit you, so watch for me footprints over there! I do the same thing. 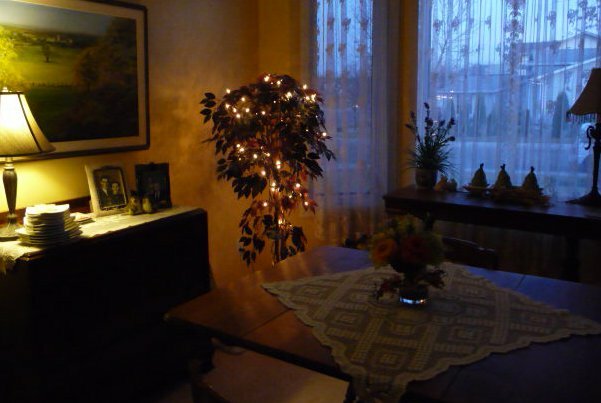 In fact, I used to have a ficus tree that I also strung white lights on. I love small lamps or a string of lights for the same reason you do...they add coziness especially as the days get shorter. I have quite a few flameless pillar candles too and even though they're battery-operated, they have a natural flickering light. I love it and think it's perfect. Laura was pretty smart wasn't she? I have white lights on my ficus tree but haven't plugged them in yet. This post inspires me to. I really love lighting candles in the evenings, too. Laura Ingalls Wilder has lovely things to say. How pretty! I've just gotta do something to prettify my house. Been spending too much time holed up in front of my laptop! Tiny lights and coziness are so important in my book. Your dining room exemplifies that perfectly. In this very early morning hour, my candle and I agree with you.